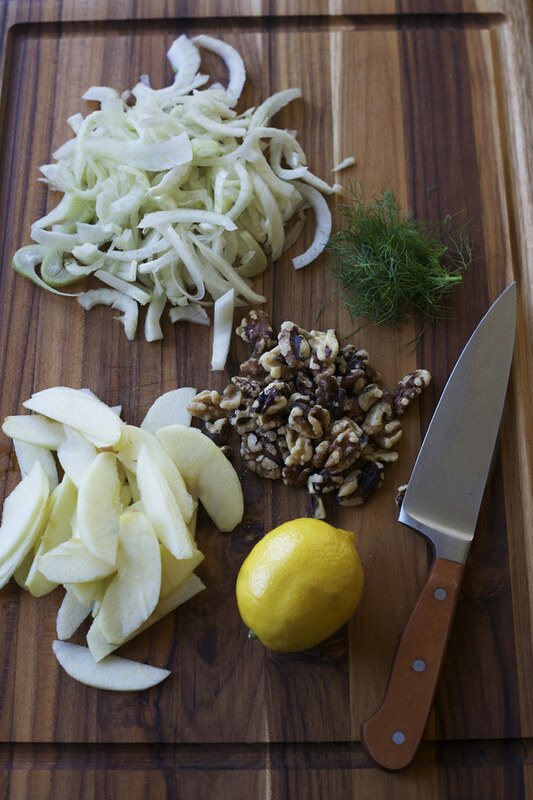 La Mesa: Fennel, Apple, and Walnut Salad. 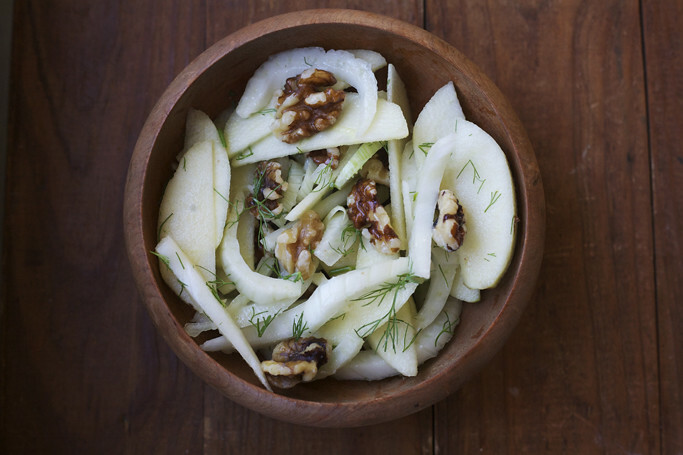 Fennel, Apple, and Walnut Salad. Hello, March. The days are growing slightly longer, and it won't be long before pear blossoms emerge. After a cold Oklahoma winter, I'm longing for warmth and sunlight. As far as cooking goes, I've been slowly transitioning from heavy winter fare, to lighter spring dishes. I've made a lot of quick salads, like this one. Let's talk about fennel. You may have only seen fennel in seed form, but it's actually a bulb. It's a member of the same family as carrots, dill, and celery. It's crisp, slightly sweet, with anise-like flavor. I'm a big fan. It's delicious raw, but you can roast or sauté it as well. If you're a bit weary, just give it a try. I don't think you'll be disappointed. I've had this fruit and fennel salad in my head for a while, so the other day I decided to finally put it together. It's really simple: fennel and apple with a lemon vinaigrette. I love the tart apple, but if you'd like something sweeter I think pear would be equally as nice (I'm going to try that next.) You can also add a bit of cheese, if you want. Most recipes will recommend using a mandolin slicer, but I don't have one, so I just sliced the apple and fennel really thinly and it worked fine. If you happen to have a mandolin, by all means use it. 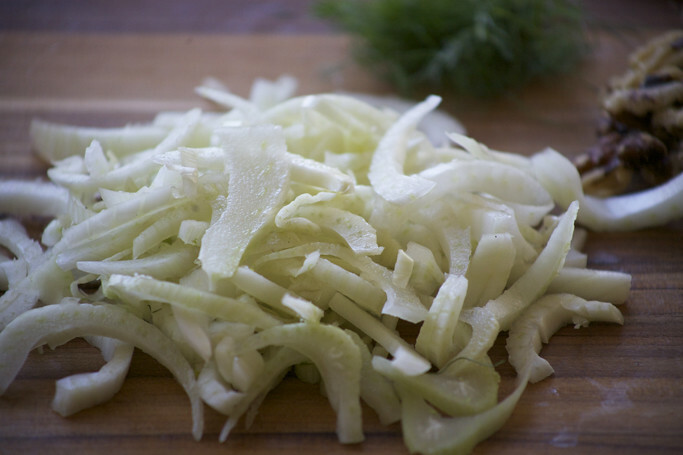 Begin by removing the outer layer of the fennel, and stalks. Trim the bottom, and slice in half. Cut out the core, and slice thinly widthwise. Next, slice the apple thinly. Immediately squeeze a bit of lemon juice over it, to keep it from turning brown. In a small bowl, combine the lemon juice, dijon mustard, and salt. Whisking constantly, add in about 2 tablespoons of olive oil. 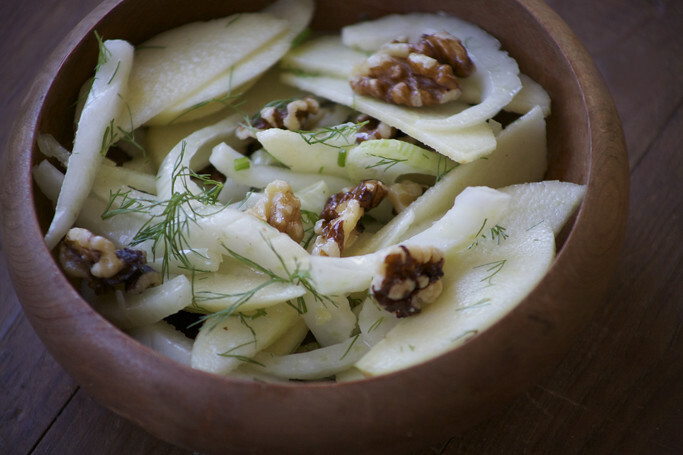 In a large mixing bowl, combine the fennel, apple, and walnuts. Pour vinaigrette over, and garnish with chopped fennel fronds. Looks so perfect for the weather we're having. Though I am looking forward to the onset of cooler days and the soups, stews and days spent in the kitchen that comes with it. I'd love to share your stuff on Pinterest, it may direct people to your site who would love your recipes! Any plans to allow pinning any time soon? this looks and sounds incredible, yum. This recipe looks absolutely delicious! My family and I just recently moved to Mesa and I have been looking for some quick and easy things to make since we have not yet finished unpacking. I think that this would be a great, healthy snack or lunch that my kids would actually like. Also, are the photos that you post in your other blog posts located in Mesa? If so, where? We would really like to do some more exploring when we have time and the scenery posts are beautiful. Thanks for the great posts, you have a really engaging blog!